At Harvard’s SEAS laboratory, Professor Robert Wood and his colleagues are making vast advances in the field of micro air vehicles. Their latest project, the Robobee, seeks to incorporate bio-inspired design with a state-of-the-art navigation system that allows for autonomous flight and coordinated work with other Robobees. Their team, which includes evolutionary biologists, engineers and computer scientists, implements many of the tricks that the bee uses to create lift in unsteady aerodynamic conditions in which classical aerodynamics struggles. Although the team has done incredible work with swarm coordination and a new pop-up-book inspired fabrication technique, the real interest for bioaerial locomotion is the bee-inspired design. Bees, which measure anywhere from a few millimeters to nearly four centimeters, must overcome many aerodynamic challenges in order to fly. As Wood’s team soon found out, the unsteady flows and irregularity of external flow play a crucial role in the flight of a vehicle of such a small size. Stacey Combes and Robert Dudley discovered that one way that bees overcome this challenge is by extending their hind legs when they encounter turbulent flows. This improves their roll stability but increases body drag creating a need for 30% more power to maintain flight. This is one way in which flight speed is limited in bees. Based on the design pictures for the Robobee, it appears that the engineers are addressing this issue with the use of halteres. These small structures posterior of the wings are present in some two-winged insects and function as small gyroscopes to maintain balance. They accomplish this by flapping up and down like the wings to create additional stability. The inspiration does not stop there. Foremost in flight and design are the wings. Though scientists understand the fluid mechanics of fixed-wing aircrafts, they are only just beginning to realize the complex aerodynamics of unsteady flows and flight tricks of bird and insect flight. From a mere visual analysis of bee flight we can draw many observations. A team of researchers from Harvard found that as a result of passive deformations one should expect “instantaneous changes in aerodynamic properties” during flapping. Consequently, Wood and his team decided to mimic bee wings because the bee is capable of achieving remarkable flight performance in the unsteady conditions that it operates in. However, the bee’s flight mechanism is not perfect. Dickinson found that bees control their power output by the arc length of their wing stroke. Bees would be more aerodynamically efficient if they changeed the rate of wing stroke rather than the arc length of the wing stroke. This is an improvement that the Robobee team will make full use of. Additionally the size and shape of the bees wing offers a beautiful and helpful example of wing structure, but it is not perfect, yet. In a recent paper by Wood and his colleagues, they found that the propulsive efficiency and control could be improved by implementing active deformation of the wings. By embedding micro-actuators, pressure distribution over the wings could be more closely controlled and aerodynamic efficiency of the wings could potentially be increased. Wood’s team has begun to apply many of these discoveries. The current prototype uses biomimetic wings on a rigid upright platform. A suitable power supply has not yet been manufactured nor has gyroscopic stabilization been implemented though Wood’s team has plans to do so. Nonetheless, the Robobee’s structural skeleton is an effective base which they can complement with the control systems for flight and coordination. 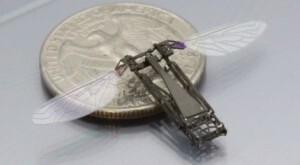 As it stands today, the Robobee team has high hopes and lofty goals for their micro air vehicle. Though the Robobee prototype is still tethered to the earth, Wood and his team have identified and begun solving many of the challenges that this project faces. 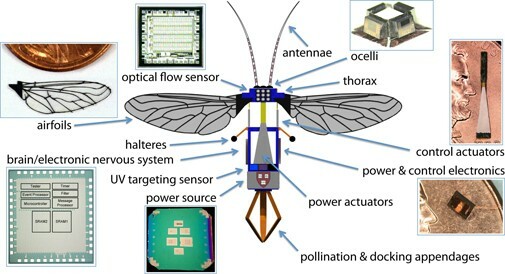 Their bee-inspired design has given them a valuable basis for their work from which that hope to learn from insect flight stabilization and the bee’s wing design and deformation. Looking forward, the team hopes that the Robobee may one day work as a swarm to execute reconnaissance missions, monitor environmental change, and even replace real bees by pollinating flowers and crops.